I know this is a late post for "Thrifty Thursday", but I've been busy. See... Yesterday, I was directed to (and darnit if I can't remember from where) to the Art Studio Makeover group in Flickr. Looking at those amazing craft rooms and art studios reminded me of what bad shape my craft room is in. I've been crafting on a card table from a plushy armchair. The chair is about two - three feet lower than the table, making working there difficult. After looking through that Flickr group, I began to envision some of the changes I want to make and was compelled to check and see if Goodwill had any tables and chairs that would be useful. 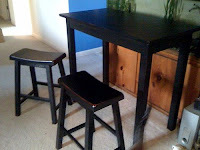 I've been really wanting a high table with a stool. So, as soon as I got off work, I headed to Goodwill. There, in all it's glory was the EXACT set I've been wanting. I will not mention the price (it was a bit steep for Goodwill), but the set is brand new and just what I've been picturing for my creative space. This is a picture of it in my living room. I wasn't able to pick it up until this morning, so I've been antsy all day to get home and get it set up. That's why this post is late, I had to set it up first and foremost before my head exploded. Now, it (and I) are in my craft room, just soaking up the loveliness that is a table and chair that are the right height for each other. Whoopee for thrift store ESP!! Now if I could only decide what I want my first project to be on it....sigh, decisions, decisions. Oh well, I hope all your thrifty visions came true too!! That is a great table set. I am really impressed you found that at Goodwill. You know how much I love Goodwill - now you know why!! I love that blog too, it's also on my last list of links (under "other blogs I read"). If you like that, you should read passive aggressive notes also - it's also on that list.